"When i speak in the prisons i focus on helping them find and accept the light within. When i speak out here, i help people find and accept the dark within. Knowing and accepting both is what spiritual peace is about." 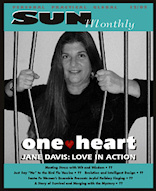 Articles Page "Chicken Soup for the Prisoner's Soul" in which founder jane davis has two stories. The book, full of inspiring stories seldom heard, is a social service tool and will be given free to prisoner's around the country. Your donations are needed to help provide this service! HOPE-HOWSE featured on KSFR, December 21st, 2010. You can listen online by clicking here. "Heard Ms. Davis this a.m. on the radio. and she could of not been more clearer in regards to the mission of Hope-Howse. Congrats"
"Happy Solstice you little SOUL WORKER. Congrats and onward into a new world of hope, humanity and action." "That was great - caught every word. " "I had the great fortune of hearing just a few minutes of your interview with Mary Charlotte this morning and am very interested in learning more about the work you do through Hope House. Please let me know if you are currently seeking volunteers and if so, what is the procedure for becoming one." HOPE-HOWSE featured on NPR's KUNM. HOPE-HOWSE Int’l, Inc. (HH) is a Georgia based nonprofit corporation currently doing business in both Georgia and New Mexico (as a foreign corporation) formed exclusively for charitable and educational purposes. The main purpose of HH is to provide support and educational services to prison inmates, gang members; at-risk children and other members of the general public in order to learn about participants, promote human dignity, improve self-esteem and encourage responsibility. Specific topics covered in the program include teaching meditation techniques, encouraging writing as a tool for healing, and practicing complete honesty with one’s self and others through group meetings and individual encounters. Through its affiliation with One Heart Ranch, LLC, hopes to build a safe, supportive, and healing community including housing, equine and canine rescue programs, and therapeutic support for those preparing to reenter society. Much of the work of HH is reaching out to the general public through articles, radio, television and print interviews and a website in order to promote communication and understanding among all people. HH is also conducting other activities consistent with the above stated goals including workshops, retreats (at One Heart Ranch) and public speaking, including high schools, colleges, detention centers and prisons. On Saturday April 25, 2009, HOPE-HOWSE founder Jane Davis was honored as Volunteer of the Year by the New Mexico Corrections Department. In honor of Jane's recognition, an anonymous donor is matching immediate contributions (up to a total of $1500). Use the "Donate" button above right now to help HOPE-HOWSE continue and expand their outreach! Rod Dupree (Atlanta, GA) and Hogan. 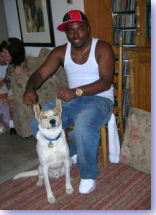 Rod was 14 when he first connected with HOPE-HOWSE. Now, at 24 he has turned his life around. 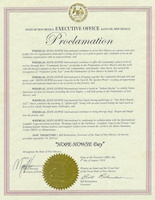 (click to read proclamations) New Mexico Governor Bill Richardson has once again, for the 8th year in a row, recognized the work of HOPE-HOWSE by proclaiming September 19th, 2010 "HOPE-HOWSE Day" throughout the State. Help us celebrate by doing an act of service for someone or something and sharing it with us so we can share it with others! and the New Mexico Film Festival in Santa Fe, NM! "HOPE-HOWSE In Action", a documentary done by award winning filmmaker Malcolm Brenner, follows HOPE-HOWSE founder Jane Davis into prison as she leads a small group of Bernalillo County Jail inmates through self-exploration, vulnerability and writing exercises. Some admit re-enacting their own childhood brutalization on relatives; others confess they feel more at home in prison than on the outside. As Davis coaxes, nudges and humors the inmates into trusting each other, they reveal their deepest hopes and fears. While not condoning their crimes, Davis conveys her profound respect for the spark of humanity in each of them. HOPE-HOWSE has an annual booth at Santa Fe's Indian Market to display Native American prison art. Come visit us in Cathedral Park. The 2011 market will be held on August 20 and 21.